Mobile commerce (mCommerce) has reached a tipping point. The overwhelming adoption of smartphones and tablets capable of running a wide variety of practical applications is driving the rapid growth of mCommerce. More than 1 billion people worldwide have a smartphone or tablet – and global business operations are being transformed as a result. These next-generation devices are powering all kinds of mobile transactions, including the ability to make both remote and local payments. The mobile point of sale market will contribute $1.1 trillion in new card transactions this year alone, according to estimates by Javelin Strategy & Research. With today’s technological advances, it’s becoming easier and more affordable for business of all sizes and types to implement a mobile point of sale (mPOS) solution that improves customer satisfaction, increases efficiency, cuts costs and drives new revenue. A recent survey of small businesses by Constant Contact found that 66% use mobile technology and 1 in 5 run a mobile tablet-based POS terminal. Businesses in the retail vertical are adopting mPOS solutions at a fast pace, creating seamless shopping experiences for their customers and quickly achieving measurable ROI. For example, retailers are line busting, speeding up the checkout process, eliminating abandonment, checking real-time inventory levels and providing their customers with a range of other benefits. Some merchants, however, have neglected to implement an mPOS system, perhaps due to the fact that they are very small, don’t have large average tickets or process a low volume of transactions. But it’s these merchants that could dually benefit from a tablet-based mPOS solution, as it can also be used to process fixed POS transactions. The retail POS industry, like many others, originally started processing payments on mainframe computers. Retail was subsequently transformed by the emergence of the Windows-based PC; today about 90% of tier 2 and 3 retail businesses are using them to run their POS transactions. Now, tablets running on iOS, Android and Windows platforms are serving as the major change agents, moving from the bottom tiers of the market up to tier 1 retailers as a complement to the existing payment acceptance infrastucture. This year, shipments of tablets are expected to surpass those of laptops. By 2015, according to some forecasts, tablets will outpace the delivery of desktop and laptop PCs. If they haven’t already done so, retailers and other businesses should embrace mPOS now or risk finding themselves being left behind. 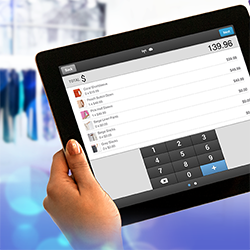 Five years from now, it’s likely that there will be 30 to 40 million mobile POS solutions built for tablet. With more than 40 million countertop POS systems installed today, many of these businesses will be extending their existing infrastructure to include a mobile solution. As a best practice, businesses should partner only with a solution provider that offers validated point-to-point encryption for all payment transactions. Security is a primary consideration when implementing an mPOS solution; ensuring cardholder data is encrypted before it enters a mobile device greatly reduces the risk of interception. In addition, work with a solution provider that has extensive payments experience and provides enterprise-level service. Choose a partner with clients in your industry already using their mPOS solution. There’s no substitute for insider knowledge and experience. Finally, choose a solution provider with a long-term technical product roadmap that covers about 18 months. A three-month roadmap is too shortsighted; choose a partner that can support you today and well into the future. A little planning goes a long way. Start preparing your mPOS solution today to be well positioned for tomorrow.